"This handsome building, now rapidly approaching completion, is situated nearly opposite the Portsmouth Town Railway Station, next to the General Post Office, and occupies the corner site of the valuable property recently sold by the War Office (formerly known as Cambridge House and grounds). The building is 80 feet in height, and covers a considerable area, the frontage in Commercial-road—as shown in sketch—being 106 feet, and the side frontage, of exactly similar appearance, 90 feet. The exterior is constructed of glazed bricks, French grey, relieved with lines of colour and ornamental Purtiand cement dressings. The corner entrance admits to a large café, 53 by 60 feet, lighted and ventilated by a lantern light above. It will be fitted with maroon plush seats, marble tables, a grill end luncheon department, parcels office, and a spacious bar with serving room behind, and lift communicating with kitchen. The ordinary bar tariff will be the same as in Miss Robinson's other houses, and no intoxicating drink will be allowed on the premises. The remainder of the ground floor is occupied by men's and women's lavatories, a	large class room, and last, but not least, the Gospel Hall, 87 by 33 feet, with ornamental coved ceiling, a handsome rostrum, and lobbies. (There is a back entrance in Willis-road). It is intended to hold Evangelistic services every evening in this hall, and to use it for many kindred purposes. The "House" entrance, while communicating with the café on one side and with the Gospel Hall on the other, admits to the main staircase, at the head of which is the office where all house business will be transacted, letters and messages received, rooms let, and orders taken; here will be the telephone box, and a series of speaking tubes to all parts of the house. Next to this is the fine commercial room, 41 by 20 feet, and 13 feet high. It to intended to offer specially good accommodation of this class, in order to make up for the absence of "the drink," which will be the rule of the house. All the bedrooms on this floor will be made extremely comfortable. Above this are three floors, giving about ninety bedrooms, with apartments for the manager and staff, the kitchens, and offices; bathrooms, &c. are on each floor, and there are cast iron staircases in suitable parts of the building to facilitate escape in case of fire. The upper floors of the side wing, over the Gospel Hall, will be reserved for soldiers and sailors dormitories, &c. Eighty-five beds will be provided here. Special attention is being paid to the sanitary arrangements, the drainage, ventilation, warming and lighting, and the water supply will, it is hoped, be as perfect as possible. Although not actually decided, it is probable that the electric light will be used throughout the building. Mr. C. G. Adames is the architect, and A. W. Bevis the builders; if all be well, they hope to complete the building by April next. The property will then be vested in Trustees (as are Miss Robinson's other houses) for permanent usefulness in this town and neighbourhood. All business profits will be expended on Evangelistic and philanthropic work in connection with the Gospel Hall, but it is also hoped that the house itself may do good service in such ways as — 1. Affording cheap and comfortable lodgings for single men. 2. Receiving soldiers' families and other travellers arriving late at night. 3. Offering facilities for large excursion parties, school treats, "Robin dinners," and the like. 4. Providing a place of resort for railway, post-office, or police officials when they have a spare hour by day or night. 5. Accommodating young people from houses of business who may require a home and board during the hours of Sunday. (There will be no serving at the bar on Sundays.) The cafe, open by five a.m. each morning, will a boon to many. It may be mentioned that Mr. Alfred Grigsby will be the manager, and will select his own staff of assistants. The entire cost of site, building, and furnishing will not be less than £38,000. Up to this date Miss Robinson and her friends have given £12,400, and other friends have lent £6,000, Miss Robinson will be very glad to hear from any willing to help by gifts or by loans at 3½ per cent and will furnish all particulars on application. Her address is Soldiers' Institute, Portsmouth." 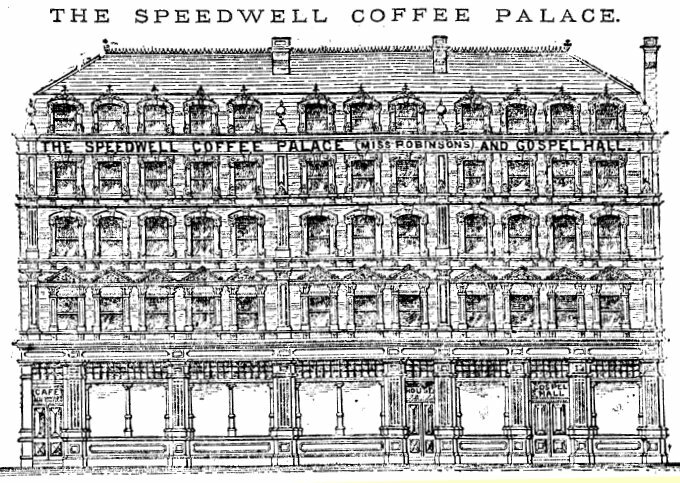 The Speedwell Coffee Palace, named after the flower rather than the recently commissioned warship, was formally opened on Friday 1st August 1890. It was just one of Sarah Robinson's many projects, the original and most important being the Soldiers and Sailors Institute in Portsmouth High Street. Her story is told at some length in the People section of this site. The Speedwell differed from her other projects in that it attempted to combine a commercial, albeit temperance, hotel with temporary lodgings for servicemen and others who needed a secure bed for the night. As a consequence she met with some opposition from other hotel owners who claimed she was using private subscriptions to make a commercial profit and thereby undercut their businesses. Miss Robinson answered such criticism by pointing that any profits would be ploughed back into the work of the Gospel Hall, which was a part of the premises. In practice she had considerable difficulty meeting the accrued costs of building and running the hotel and in May 1892 she gave up the pursuit of funds and handed the building over to a Limited Liability Company who promised to carry on the work she had begun there. The arrangement included the terms that Miss Robinson would personally take on £3000 of the outstanding debt and that the new owners would convert the Gospel Hall for business purposes and build a new Hall, to be called "The Welcome Mission" elsewhere in Landport. The building, now renamed "The Speedwell Hotel", was managed by Alfred Grigsby, as it had been since it's opening day. Although advertising itself as the 'best appointed hotel on the South Coast' it does not seem to have been a great financial success as it lasted just 28 years before being demolished.